The Federal Reserve has been gradually raising its target interest rate (the "federal funds interest rate) for about two years, since early 2016. This increase has been accompanied by a controversy that I think of as a battle of metaphors. By raising interest rates, is the Fed stepping on the brakes of the economy? Or is it just easing off on the accelerator pedal? 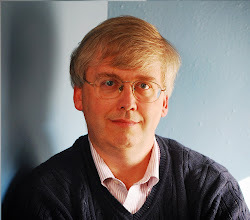 To shed light on this controversy, it would be useful to to have a measure of financial conditions in the US economy that doesn't involve one specific interest rate, but instead looks at actual factors like whether credit is relatively available or not, whether leverage is high or low, and whether those who provide loans are able to raise money with relatively low risk. 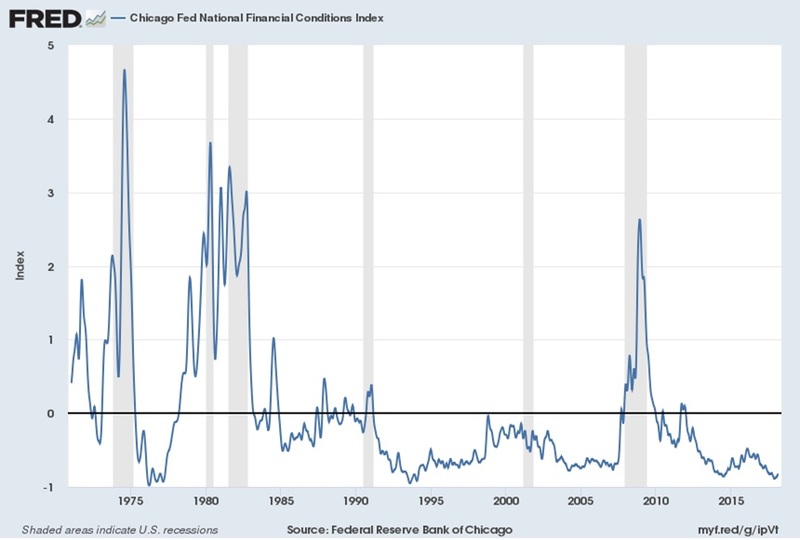 Fortunately, the Federal Reserve Bank of Chicago has been putting together a National Financial Conditions Index based on exactly these components. Here's a figure of the data going back to the 1970s. This figure needs a little interpreting. Zero is when financial conditions are average. Positive numbers reflect when financial conditions are tight or difficult. For example, you can see that in the middle of the Great Recession, there is an upward spike showing that financial conditions were a mess and it was hard to raise capital or get a loan at that time. Several previous recessions show a similar spike. On the other side, negative numbers mean that financial conditions are fairly easy by historical standards to finance and receive loans. 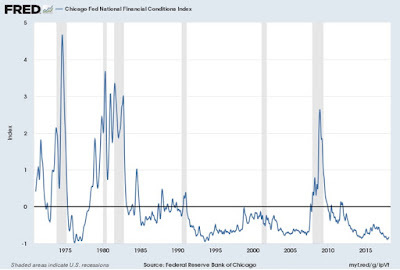 As the Chicago Fed explains: "The National Financial Conditions Index (NFCI) and adjusted NFCI (ANFCI) are each constructed to have an average value of zero and a standard deviation of one over a sample period extending back to 1971. Positive values of the NFCI have been historically associated with tighter-than-average financial conditions, while negative values have been historically associated with looser-than-average financial conditions." The interesting thing about our present time is that although the Fed has been raising its target interest rate since early 2016, financial conditions haven't gotten tighter. Instead the National Financial Conditions Index is lower now than it was back in early 2016; indeed, this measure is at its lowest level in about 25 years. At least for the last two years, any concerns that a higher federal funds interest rate would choke off finance and lending have been misplaced. Instead, having the Fed move the federal funds rate back close to its historically typical levels seems to have helped in convincing financial markets that the crisis was past and normality was returning, so it was a good time to provide finance or to borrow. The National Financial Conditions Index can also be broken down into three parts: leverage, risk, and credit. 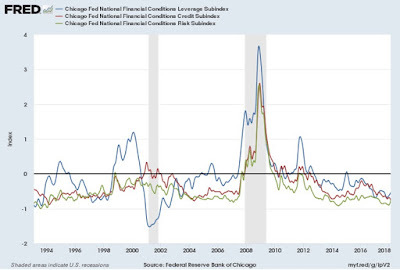 The Chicago Fed explains: "The three subindexes of the NFCI (risk, credit and leverage) allow for a more detailed examination of the movements in the NFCI. Like the NFCI, each is constructed to have an average value of zero and a standard deviation of one over a sample period extending back to 1973. The risk subindex captures volatility and funding risk in the financial sector; the credit subindex is composed of measures of credit conditions; and the leverage subindex consists of debt and equity measures. Increasing risk, tighter credit conditions and declining leverage are consistent with increases in the NFCI. Therefore, positives values for each subindex have been historically associated with a tighter–than–average corresponding aspect of financial conditions, while negative values indicate the opposite." Here's a figure showing the breakdown of the three components. Although the three lines do tend to rise and fall together, it seems clear that the blue line--showing the extent of leverage or borrowing--plays an especially large role in the fluctuations over the last 25 years. But right now, all three parts of the index are comfortably down in the negative numbers. Patterns can turn, of course. Perhaps if the Federal Reserve increases the federal funds rate at its next scheduled meeting (March 20-21), financial conditions will worsen in some substantial way. But at least for now, the Federal Reserve raising interest rates back from the near-zero rates that had prevailed for seven years is having the (somewhat paradoxical) effect of being accompanied by looser financial conditions. And concerns over raising those rates at least a little further seem overblown. Is the Euro Out of Danger?